Loyal guests of luxury cruise line Seabourn have long awaited any sort of clue or even implication about an upcoming world cruise itinerary, and after six years, we can now reveal that there is a fabulous voyage ahead. Barbados – it’s impossible not to relax in this warm and friendly destination, where you’ll be welcomed with the sounds of rhythmic reggae and a glass of rum punch. Durban – this South African city offers an intoxicating fusion of African, Indian, and Colonial influences which you’ll find in the food, architecture, and atmosphere. Chennai – steeped in history, this East Indian city has plenty to do whether you’re looking for some cultural enlightenment, or beachside fun and relaxation. Phuket – probably Thailand’s most well-known island resort, Phuket is absolutely idyllic. Think white sands, crystal clear waters, and some truly incredible food. Komodo Island – this Indonesian island is undeniably unique, being home to more than 2,500 komodo dragons. Take in some outstanding views of natural beauty here. Honolulu – the Hawaiian capital juxtaposes a relaxed beach atmosphere and a bustling city life in the best way. Enjoy a bit of cultural exploration knowing you’re never far from a drink and a sun lounger. This brilliant cruise will take place on Seabourn Sojourn; a beautiful vessel that has transported passengers to some spectacular destinations over the years. 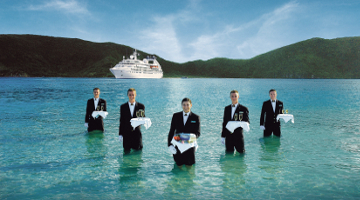 Hosting fewer than 500 guests, she is a moderately sized luxury ship offering the very best in facilities and service. Find out more about Seabourn Sojourn, and all the dining, entertainment, and other amenities onboard. Get more details about this superb round the world cruise, and talk to our sales team for more information.